Scottish Water has said it is dealing with four times the normal level of calls from customers needing help with burst pipes, following the recent thaw. The utility said its staff had taken about 26,000 calls since Christmas Eve. About 75% of the calls were about internal pipe problems. The firm said in these cases it was a householder's responsibility to arrange repairs. Scottish ministers said 160,000 litres of water would be sent to Northen Ireland, where supplies are disrupted. By Wednesday, about 36,000 households across the province had no water supply. A shipment from bottling plants in Banff and Forfar was to be loaded onto the Larne ferry, following discussions between the Scottish government and the Northern Ireland Assembly. Arrangements for the delivery of the bottled water were being taken forward by Scottish Water. The firm's customer services director, Peter Farrer, said: "Given that so many people are experiencing unprecedented problems with their water supply in Northern Ireland, Scottish Water is happy to offer its support and respond positively to this request for assistance. "We understand completely that homes and businesses in Scotland are without water because of leaking or burst pipes, however this helping hand to our neighbours will not affect our service to our customers in Scotland." He described the situation in Scotland as the worst he had seen during his 26-year career. "This has been sustained low temperatures for the last four weeks so the ground frost has been getting lower and lower and impacting on more pipes under the ground," he added. Mr Farrer said the publicly-funded company had drafted in extra resources to deal with the impact of the thaw. "We are aware that we may be taking longer to answer some calls or respond to appeals for help," he said. "For this we apologise and thank our customers for their patience as we work to deal with all these issues. "If we are unsure if this is an internal issue with the household, or an issue with our assets, or both, we then send a field technician out to the customers premises to assist." 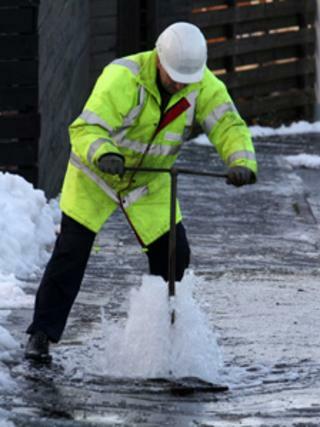 Scottish Water also appealed to businesses and homeowners to check properties left empty during the festive holiday for burst or leaking pipes.